Located in Playa del Carmen, this beachfront hotel is in the entertainment district, just steps from Quinta Avenida and Mamitas Beach Club. Playa del Carmen Maritime Terminal and Xplor Theme Park are also within 9 mi (15 km). Located in the heart of Playa del Carmen, this spa hotel is within a 5-minute walk of Quinta Avenida and Playa del Carmen Main Beach. Mamitas Beach Club and Quinta Alegría Shopping Mall are also within 10 minutes. 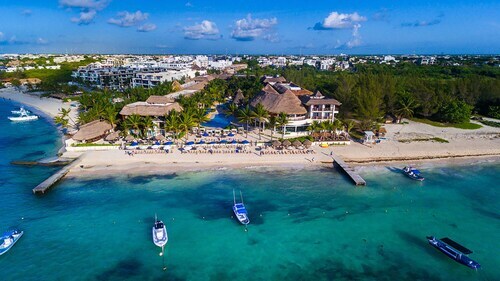 Set along the Caribbean, this Riviera Maya resort offers relaxation on the private beach and quick access to the shops, restaurants, and nightlife of Playa del Carmen; popular Fifth Avenue is 1 block away. 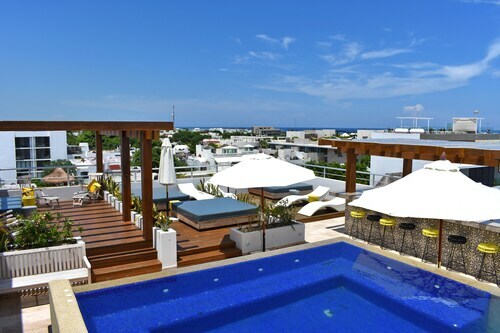 Located in the heart of Playa del Carmen, this all-inclusive property is within a 5-minute walk of Quinta Avenida, Playa del Carmen Main Beach, and Mamitas Beach Club. Playa del Carmen Maritime Terminal and Punta Esmeralda Beach are also within 2 mi (3 km). Situated by the sea, this spa hotel is steps from Mario Villanueva Stadium Madrid and Quinta Avenida. Playa del Carmen Main Beach and Mamitas Beach Club are also within 10 minutes. Located in the heart of Playa del Carmen, this romantic property is steps from Mamitas Beach Club and Playa del Carmen Main Beach. Quinta Avenida and Playa del Carmen Maritime Terminal are also within 1 mi (2 km). 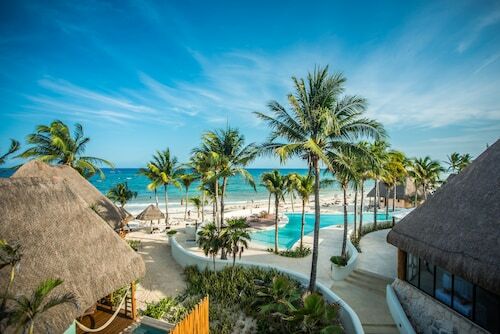 Located 4 blocks from 5th Avenue in downtown Playa del Carmen, this all-inclusive resort has its own offshore reef and private beach. Situated in Playa del Carmen, this condo building is close to Mamitas Beach Club, Quinta Avenida, and Playa del Carmen Main Beach. Also nearby are Playa del Carmen Maritime Terminal and Punta Esmeralda Beach. Modern Condo w/ Shared Pools, Sundeck & Flatscreen TV - Walk to the Beach! 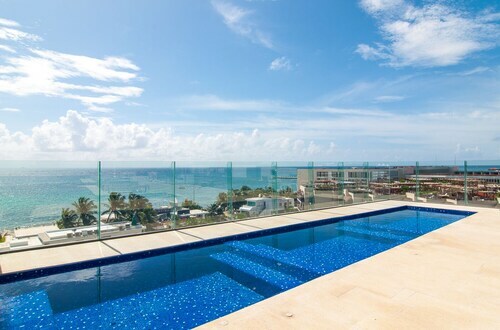 Situated by the ocean, this apartment building is steps from Mamitas Beach Club and Playa del Carmen Main Beach. Quinta Avenida and Playa del Carmen Maritime Terminal are also within 1 mi (2 km). Located in the heart of Playa del Carmen, this golf hotel is within a 5-minute walk of Playa del Carmen Main Beach, Mamitas Beach Club, and Quinta Avenida. Playa del Carmen Maritime Terminal and Punta Esmeralda Beach are also within 2 mi (3 km). Located in the heart of Playa del Carmen, this romantic condo building is steps from Mamitas Beach Club and Playa del Carmen Main Beach. Quinta Avenida and Playa del Carmen Maritime Terminal are also within 1 mi (2 km). Organizing a trip to Mamitas Beach Club? It's in Playa del Carmen, approximately 790 miles (1,271 kilometer) outside the national capital, Mexico City. After an exhilarating day of sightseeing, you'll be able to relax and unwind at one of the many accommodations nearby. Within 0.6 miles (1.0 kilometer) of Mamitas Beach Club, you'll discover 164 candidates. 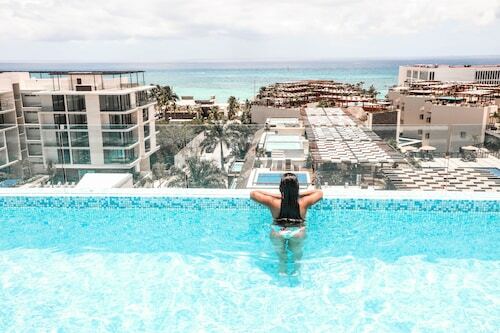 Narrow down your hunt by investigating The Royal Playa del Carmen All Inclusive Spa & Resort, El Taj Oceanfront & Beachside Condo Hotel and Maya Villa Condo Hotel & Beach Club. See your dollar go a little farther by booking a room at one of the less expensive hotels available nearby. You might wish to reserve the Hotel Hacienda Maria Bonita, 0.6 miles (1.0 kilometer) away. 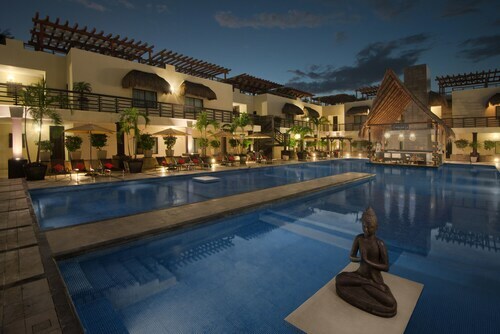 Alternatively, there's also the Hotel Maya Azul, 0.6 miles (1.0 kilometer) away. Those that savor the finer things will definitely be spoiled for choice based on the range of high-quality hotels nearby. You can stay at the Playacar Palace All Inclusive, since it's just 1 mile (2 kilometers) away, or the Gran Porto Resort All Inclusive, a mere 0.4 miles (0.6 kilometers) away. If you'd love a quick rest from roaming around Mamitas Beach Club, take the short walk to Los Pachucos for a fresh-brewed coffee. Or, perhaps you can look for a free table at Fuego Restaurante & Cantina. It's close at hand and renowned for serving delicious lunches and dinners. Of course, there's no finer way to end a day of exploring than with a relaxing drink. Mamita's Beach Club, also a brief walk away, is the place to go. Follow the signs to Pier Navega, a place where magnificent ships come and go. Indulge in some serious shopping at Quinta Alegria, a popular retail destination for both locals and visitors. Nuestra Senora del Carmen Catholic Church is a peaceful place of worship and an interesting local attraction that you might like to visit. If you hope to get to know a few of the local residents, make your way to Central Square. Explore the depths and partake in some underwater sports at Yucatek Divers. How Much is a Hotel Room in Mamitas Beach Club? 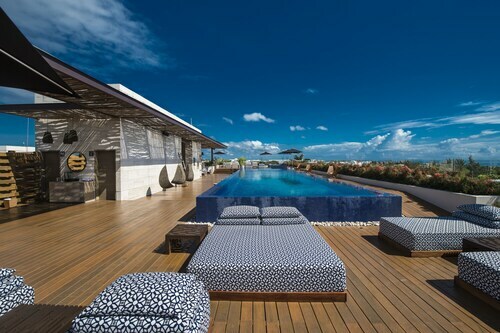 Hotels in Mamitas Beach Club start at $49 per night. Prices and availability subject to change. Additional terms may apply.